Many biological activities have been envisioned for fullerenes and some of them seem to be very promising. The lack of solubility in biologically friendly environments is the major obstacle in the development of this field. The possibility of multiple fuctionalization can be exploited to get more soluble compounds but, up to now, only a few polyadducts, presenting perfectly defined geometry, can be selectively prepared avoiding long purification processes. The toxicity of this third allotropic form of carbon is an aspect related to application in medicine and biology, while the concern about the environmental impact is due to the industrial production of fullerenes. Many studies are dedicated to both aspects and, so far, it is not possible to have a definitive answer although the current findings allow some optimistic vision. 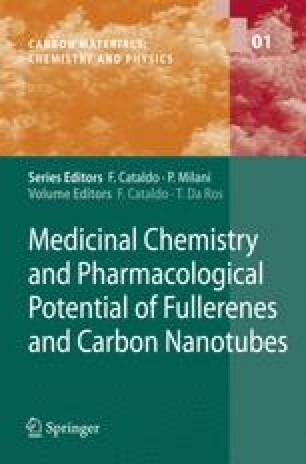 In this chapter the main biological applications of fullerene and fullerene derivatives will be reviewed, with special attention to the most recent advances in this field. Antiviral and antibacterial activity, enzymatic inhibition, and DNA photocleavage are some aspects considered herein, together with the use of these nanostructures as possible vectors for drug and gene delivery. The most promising applications include the use of endohedral fullerenes, filled by gadolinium, in magnetic resonance imaging (MRI) and the antioxidant capacity exploitation of some tris-adducts and fullerols.